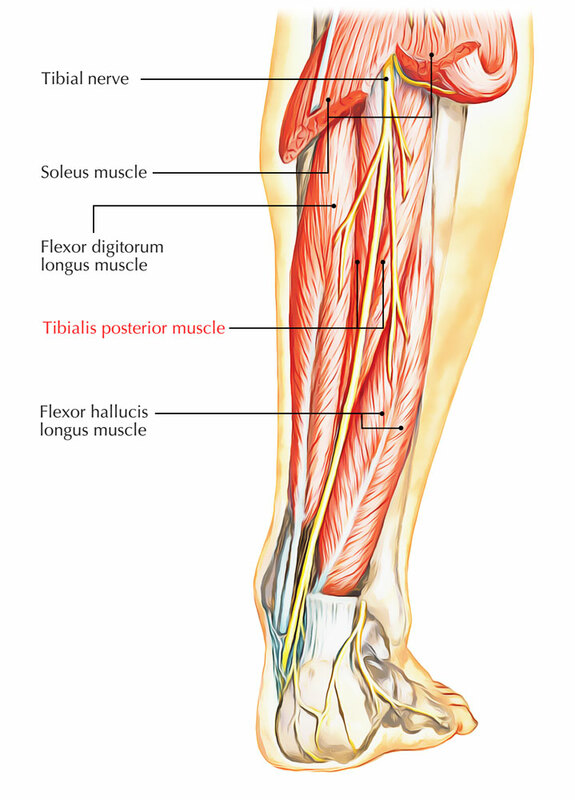 The tibialis posterior muscle is a rather small muscle, located within the rear end of the calf. The tibialis posterior muscle emerges on the inner posterior borders of the tibia and fibula. It is also the most centrally positioned muscle in the leg. The muscle’s tendon runs down behind the medial malleolus (bony projection on the inside of the ankle) and ends by segregating into the main, plantar, and recurrent sections. The tibialis posterior muscle emerges from the adjacent posterior sides of the tibia and fibula and the interosseous membrane. It lies between and is overlayed by the flexor digitorum longus and the flexor hallucis longus muscles. It is also connected to the interosseous membrane, which connects to the tibia and fibula. Upper 2/3rd of the lateral part of the posterior surface of tibia under the soleal line. Posterior surface of the fibula facing the medial crest. Upper two-third of the posterior surface of the interosseous membrane. 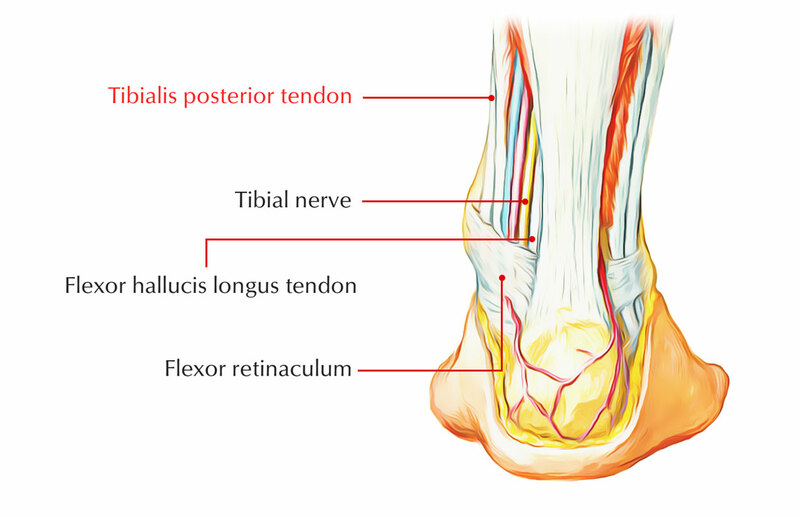 The tendon of the tibialis posterior muscle (sometimes called the posterior tibial tendon) terminates by breaking up into plantar, main, and recurring components and goes down posterior to the media malleolus. The main portion inserts into the plantar side of the medial cuneiform and the tuberosity of the navicular. The insertion of recurrent portion is into the sustentaculum tali of the calcaneus. The plantar portion enters into lateral cuneiforms and the cuboid and the bases of the second, third and fourth metatarsals, the intermediate. In the lower part of the leg, crosses superficially by the tendon of FDL. Grooves back of the medial malleolus. Superficially to the deltoid ligament and bypass deep to flexor retinaculum. The tibialis posterior also constricts to generate inversion and helps in the plantar flexion of the foot at the ankle, as well as being a key muscle and tendon for stabilization. The tibialis posterior has a major role in assisting the medial and longitudinal arches of the foot. Dysfunction of the tibialis posterior, featuring, a valgus deformity because of unopposed eversion when inversion is lost, as well as rupture of the tibialis posterior tendon, can cause flat feet in adults. It is supplied by tibial nerve. It is supplied by tibial artery. Injury or degeneration of the tendon the point at which it inserts into the foot bones creates pain on the inside of the foot which may transmit along the length of the tendon. Symptoms include pain on the inside of the foot which may radiate along the length of the tendon under the foot. Pain worsened by passive eversion or resisted opposition. Or in other words if a therapist turns the foot outwards to stretch the tibialis posterior or if the patient diverts the soles of the feet inwards as the therapist resists to pressure the tendon. A creaking feeling called crepitus can often be felt when the tendon moves.